Butter a 10x23cm* loaf pan and flour the insides, tapping out the excess. Sift the almond meal and flour together three times. Set aside. With an electric mixer, beat butter until light and fluffy. Add sugar and beat well. Add the eggs, gradually. Add the cream and rum. Beat to incorporate. Fold in the sifted ingredients with a rubber spatula. Pour into prepared pan. 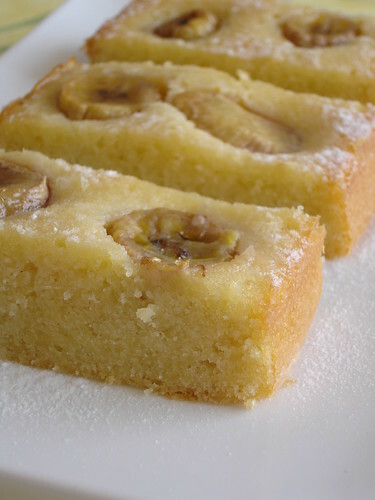 Peel and cut the bananas into 3-4 pieces each; “stick” them into the cake batter, keeping the pieces standing – there should be half an inch of banana out of the cake batter, or so. Bake for 40-50 minutes or until a skewer inserted in the cake comes out clean. Mix well all the ingredients for the syrup. Leave to cool in the pan for 10 minutes; unmold and drizzle with the syrup. Dust with confectioners’ sugar when serving. I like your banana almond cake ! looks moist. I want a piece ! i love "fight club" too!!!! not until i watched this movie, i didn't like brad pitt at all. your little cake looks delicious. I am a product of American public school, and can't convert measurements to save my life! how many tablespoons butter? cups of sugar? please help! your cake looks awesome and we would really enjoy baking it. So, did you manage to watch the movie? It's one of my favs, as is banana cake! I had to laugh because just this weekend my brother was talking about the Fight Club and I told him I haven't watched it, so it was this whole round of, "You haven't watched the Fight Club???!!!" Soon! The texture of that cake is fabulous. It looks so moist and dense, just the way I love it. oh my, you truly must watch fight club-it is such a great movie! definitely my all time favorite. 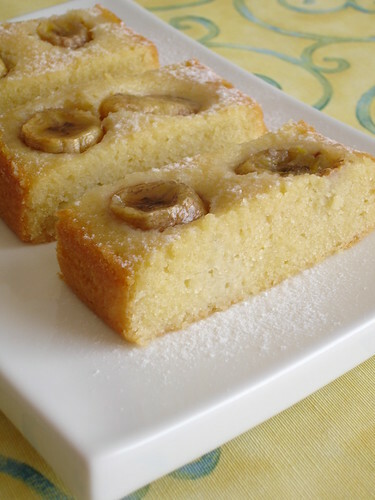 and as for this cake, it looks so moist and delicious-those bananas on top just make it perfect! This looks amazing and I'd really like to try it, but can you suggest a non-alcoholic substitute for the rum? Thanks! wow-wow!! this cake does look super moist!! I like all those ingredients, the cake looks really special. This looks fantastic and I can't wait to try to make it. I have so many recipes like this! I'm glad you finally made this one because it looks scrumptious. You know me and baking, Patricia [although I did just make some hazelnut rosemary jam cookies for the holidays]. But with rum in the cake and the syrup, I just may have to try this! Sara, these are the measures I usually use: 1 cup sugar = 200g, 1 cup flour = 140g, 1 tablespoon butter = 14g. Hope it helps! Mark, hahaha, you crack me up. And I adore baking with bananas. And you can come over whenever you feel like it, darling! Susan, very dense and moist, indeed. I love baking with almond meal. Ayat, I don't know... Maybe lemon or orange juice? Katie, I hope you try it, sweetie! Terry, I have to see those cookies of yours! I came across your post by looking for a recipe for white chocolate cranberry truffles and was impressed by your blog. Every picture you have taken gives wonderful credit to your creations. I'll have to stop by some more for more great ideas. 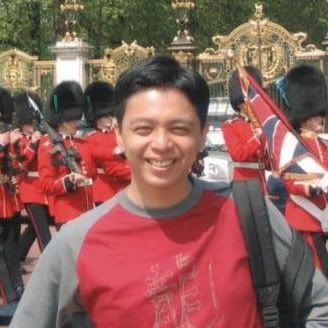 Thankyou for the blog and recipes! ps-I've been reading through your blog and saw that last year you made a buche de noel and wanted to make it jelly roll style. I actually have a recipe I found from martha stewart that is exactly that. she even goes so far as to make it look like a tree log with chocolate bark pieces with accents of marzipan-fig acorns and thin cookie leaves. it's amazing. if you're interested let me know. Pat, i have already told you how much i love your cake. it is schduled and i will do it on my hols. Now THIS is a wonderful way to use bananas! It does look wonderful for kids of all ages. 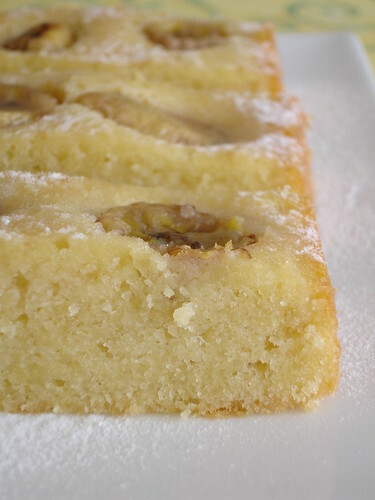 Thanks for sharing with Banana almond cake. I know my grandson will love eating this. Almond cake and then with a few dollops of vanilla ice cream and I am in heaven!! !